And I'm really good at Super Mario Galaxy, too. We all know about gamers who live out their rock star fantasies playing Guitar Hero - now meet the guitarist who uses a gaming controller when he plays for real. 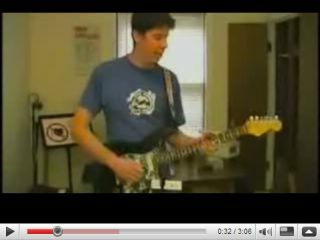 Rob Morris straps a Wiimote to his Strat, then uses the controller's motion sensitivity to create a variety of effects. Pitchbending is a particular favourite; the Wiimote data is sent to a computer running Max/MSP, and this then sends data via MIDI to a Digitech pedal. The system enables Rob to add slight tremolo or bend the pitch by up to an octave, and his effects can be applied to multiple notes, too. Check out this YouTube video to see and hear how everything works. Could this be the future of guitar effects processing?